A bride and groom have reportedly been joined together by a robot in a ceremony which has been considered groundbreaking. According to Daily Star UK, a bride and groom have been married with the help of a robot in a world first ceremony. Abdullah Ahmad Tahlak married the daughter of Ali Ahmad Ahli at the futuristic Service 1 Centre in Dubai. The proceedings were conducted through a video conference link between the bride, groom, their families and a judge in a Dubai court. 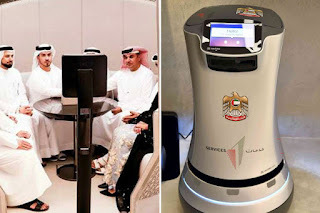 After the ceremony, Abdullah signed a marriage licence via a roaming robot at the smart centre. It utilises artificial technology IBM Watson, robots and one employee to represent 14 government bodies. Watson explains more than 100 services to customers and answers their questions in English and Arabic through the Middle East’s largest touch screen, local media report. Abdullah said: “I am pleased with trying out this high quality service offered by the UAE government. “I feel very proud to witness these facilities being provided to ensure the happiness of customers. Sheikh Mohammed, Vice President of the United Arab Emirates, said: “We want the customer to perceive a different feel or environment in service centres: one that is welcoming, relaxing, flexible and uses advanced techniques. “The centre will also be a laboratory to test suggestions made by the public.